If it's been a while since you cleaned out your cupboards, you may want to give your kitchen an overhaul before your next shopping trip. You'll be surprised at how much easier meal planning and cooking is when you have a tidy kitchen. You'll also be surprised at just how much money you can save too. When your pantry, fridge and freezer are organized, you will stop over-buying. Using inventories will show you at a glance just how much food you have on hand and what you need to add to the shopping list. · Check the food in your pantry for expiration dates; if it is past its prime, throw it out. · If an item isn't expired, but no one is interested in eating it, throw it out. Unopened items can be donated to family, friends or a local food bank. 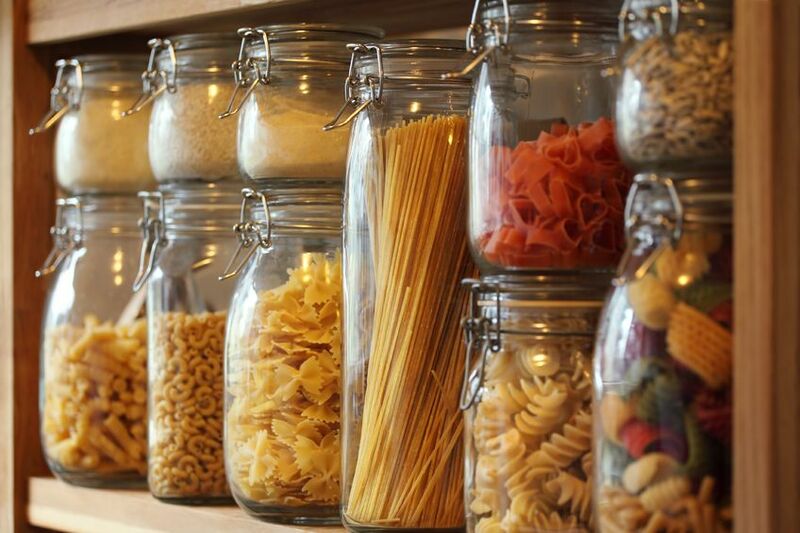 · Group like foods together; for example store all canned foods in the same cupboard and all dry goods, such as rice and pasta in the same cupboard. Designate a shelf to baking supplies. Store flours, dried fruits, coconut and other baking supplies in air-tight containers to keep them fresh. If you put new packets into the freezer for 72 hours before putting them in the pantry you won't be bothered with pantry moths and weevils. If you have the freezer room they can be stored in the freezer in air-tight containers permanently. · Keep drink mixes, coffee and tea in the same area and keep breakfast cereals, breakfast spreads and other breakfast items grouped together. When you want something, you'll know right where to go to get it. · Keep regularly used items front and centre. You'll save time by not continuously searching, reaching and bending for these items. · If you pack a lot of lunches, designate a “lunch” shelf or cupboard. Place lunch bags, Ziploc bags, greaseproof paper, foil etc. in a basket so they are all together and not falling all over the pantry. · When you start packing the lunch, you simply open the lunch cupboard, grab your lunch stuff and start packing. Of course, you'll need to walk over to the fridge to grab meats, cheeses, jams, fruits, and so forth, but having most of the items in one place will save you a lot of time. · Clean out the fridge each week. Leftovers have a short shelf life and you don't want to risk getting sick by eating something that should have been frozen or already been thrown-out. When you don't have any clutter in your way, you may find that you actually enjoy cooking for your family much more than before. Not only that, your grocery bill will go down considerably. With warmer weather starting I am starting to see pantry moths and I could not go through the big pantry clean out I did last year. All my rice,flour,coconut etc I keep in fridge permanently yet still they come! Bay leaves do not work and everything except cans are in tight containers. Maybe instead of pantries in Australia we should come up with new ways of food storage? Your post has at least given me incentive to start even one shelf at a time would be better than ignoring it.